The Skinny: Unheralded but exciting and involving kung-fu picture from Ringo Lam. 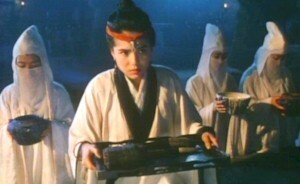 by Kozo: Damn good ancient costume kung-fu and sword movie from that master of touch-feely films, Ringo Lam. Plot: During the Ching Dynasty, martial arts hero Fong Sai-Yuk (Willie Chi) is chased by Manchu soldiers. He shacks up with a runaway prostitute (Carman Lee), but the two are caught and taken to the Red Lotus Temple, the scariest place since the Temple of Doom. There the head baddie (Wong Kam-Kong) terrorizes everyone by tearing the heads off of women and painting scary looking stuff on the walls. Then lots of fighting occurs. image courtesy of Star Laserdisc Co.